Posted on June 29, 2018 at 11:28 am. June is coming to an end, and so too is RACC’s 2017-2018 fiscal year. Now is a good moment, before a new fiscal year begins on July 1, to ruminate on RACC’s past and present, and what that means for our future. A year ago this week, we celebrated the accomplishments of our retiring executive director, and prepared to launch a national search for her replacement. Even as this transition phase continues, RACC has shown that it is leader-full, confidently moving forward as the search goes on. Throughout this shift, I have been impressed time and again with the board’s profound dedication to the organization, and the staff’s drive to lead innovations that make our work more effective, accessible, and impactful than ever before. 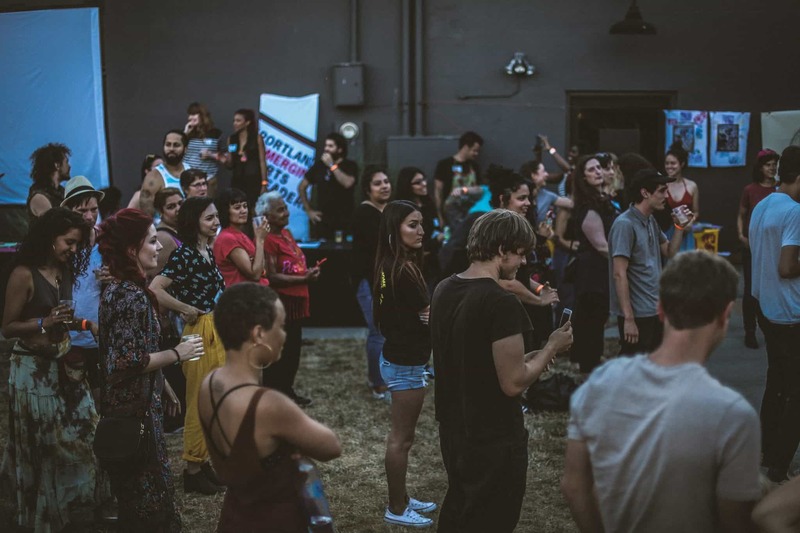 Our grantmaking program launched two new initiatives: a Capacity Building Program for culturally specific organizations, and additional Equity Investments for General Operating Support organizations that are making real progress diversifying their staff, board, and audiences. RACC revamped the Art of Leadership program to better align with the needs of small and midsize arts and culture organizations, resulting in the program’s highest attendance ever – with 63 graduates this past spring. We continue to facilitate public art projects, including three collaborations with Portland Parks this past year – two of which were in East Portland. Big projects are also getting underway at the Multnomah County Health Department and with the renovation of the Portland Building… stay tuned! Our Fresh Paint temporary mural program invited its first three muralists of color to paint Open Signal’s wall facing the highly visible Martin Luther King Jr. Blvd., and we collaborated with Prosper Portland to install murals by Eatcho and Arvie Smith at the new Natural Grocers store on NE Alberta St depicting Northeast Portland’s African American history, present, and future – check out the video. RACC’s arts integration program, The Right Brain Initiative, continues to expand but with a new focus on serving schools where the achievement gaps are greatest – specifically schools where 30 percent or more of the population are students of color, English language learners, low-income and/or in neighborhoods with limited arts resources nearby. RACC continues working to build better relationships with marginalized communities, and our community engagement team has been listening to shape RACC’s program delivery model as a result. This past year, staff launched the Art & Power conversation series that centers the experiences of artists from historically marginalized communities with topics ranging from cultural appropriation to the healing power of the arts. We’ve also had learning moments. As an organization advocating for and supporting artists, we take continuous feedback and improvement seriously. This past year, we’ve done some new things or made changes based on feedback we received from community members, artists, and arts institutions. Some highlights include: conducting a survey with all General Operating Support organizations and restructuring how organizations are funded; adding more project grant application cycles per year to address artists’ needs; modifying our executive director search process based on community feedback; and developing policies and programs aligned with our equity lens. RACC is stronger and more committed than ever as we continue working to enrich our communities through arts and culture. In a region that is ever-changing and growing, we keep the community’s arts and cultural needs first and foremost in our mind as we move through changes of our own. Going forward, we have work to do to build deeper relationships with our government partners, and will be rolling out a new grantmaking framework for General Operating Support organizations in the months ahead. We are also in the process of revamping our fundraising programs in response to funding cuts, and pledge to reinvigorate RACC’s role in building a strong arts and culture advocacy network. This September, RACC will present its annual State of the Arts report to Portland City Council. Some of our report will focus on these accomplishments, but it is also incumbent upon us to remind City Council of the real and persistent challenges we face as artists and arts workers. I’d love to hear about your success stories from the past year, and your perception of what’s working and what’s not. Please help us inventory the unmet needs that you experience or observe in our local arts community by dropping me a line at jhawthorne@racc.org with your thoughts. From myself and all of us at the Regional Arts & Culture Council, thank you for supporting our work and holding RACC and our government partners accountable for more equitable investments in our community of artists, arts educators, and nonprofit organizations. We look forward to building even more with you in the year ahead.